The information on this website is in the public domain. No permission is required to quote, use, distribute or republish. 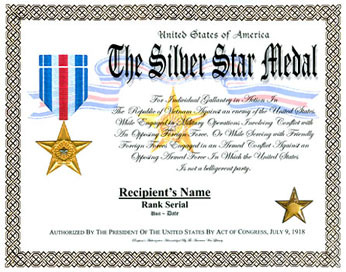 The Silver Star is awarded to a person who, while serving in any capacity with the U.S. Army, is cited for gallantry in action against an enemy of the United States while engaged in military operations involving conflict with an opposing foreign force, or while serving with friendly foreign forces engaged in armed conflict against an opposing armed force in which the United States is not a belligerent party. The War Library is continually compiling a list of confirmed Silver Star Medal recipients from all Service Branches. The growing list is publicly accessible on The War Library. Library access information is here: amervets.com/library.htm... Upon accessing The Library's MAIN MENU click on: "MEDAL LISTS/ROSTERS"